In just a few weeks I’ll back up the whale-shaped baby mobile and bring it home to Bømlo was a little baby girl will have it hanging over her crib. She’s not expected until August, but since I and Gustav are spending the Easter there, it’s a great occasion to hand it over to my little sister. She’s also got to borrow my precious rattan crib, but I need to find another way to transport it from Oslo to Bømlo. 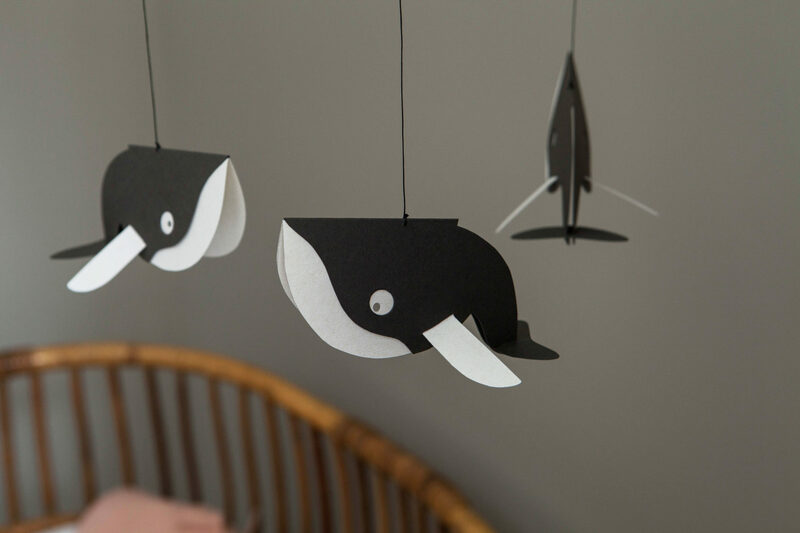 Anyway, I’m in the process of putting together a little video tutorial on how I made this whale-shaped baby mobile, but in the meanwhile, I’m sharing a written tutorial — just in case you feel the itch for doing some paper craft. If so, feel free to download the template here, and keep reading the step-by-step instruction on how I made it. 1 – Print the template in A4. Be careful not to change the scale when you print. 2 – Cut out the three shapes in the template. 3 – Fold the heavy white paper by using a ruler and a scoring bone to create a nice fold. Make sure the fold is parallel to the edge of the paper. Repeat the process for the dark paper. 4 – Place the template for the tummy (1) on the white paper so that the dotted line in the template is aligned with the fold. Transfer the template to the paper with a pencil. Remember to draw in the eyes. Use an awl or a needle to mark the start and end of the short fold line on the top of the fin marked with a dotted line in the template. 5 – Cut out the tummy (1). Use the 3 mm hammer punch to make the holes for the eyes. 6 – Score the short dotted line on the top of the fin on both sides of the whale. Fold carefully upwards. 7 – Place the template for the body (2) on the dark paper in the same manner you did for the white paper. Transfer the template by using a pencil. Remember the eyes, and use an awl to mark the beginning and the ends of the cuts (three in total). Also, mark the small dot in the top of the whale’s back where the thread will be. 8 – Cut out the body (2), and cut the small diagonal lines on the tale of the bottom part of the body. Use the 10 mm hammer punch to make the holes for the eyes. 9 – Place a small strip of tape on the inside of the body (2) on the fold where the thread will be. This to enhance this area a bit. 10 – Use an awl or a thick needle to make a hole where the thread will be. 11 – Connect the tummy (1) to the body (2) by threading the fin from the tummy through the cuts in the body (2) from the inside of the whale. 12 – Thread the thread through the small hole you made in step 10, and tie it well. the length of the thread equals the distance from the whale to the big ring + the distance from the big ring to the small ting (which will be hung to the roof) + a few centimeters for tying. 13 – Transfer the template for the tail fin (3) to the dark paper. Note that the tail fin will be on a single layer of paper. 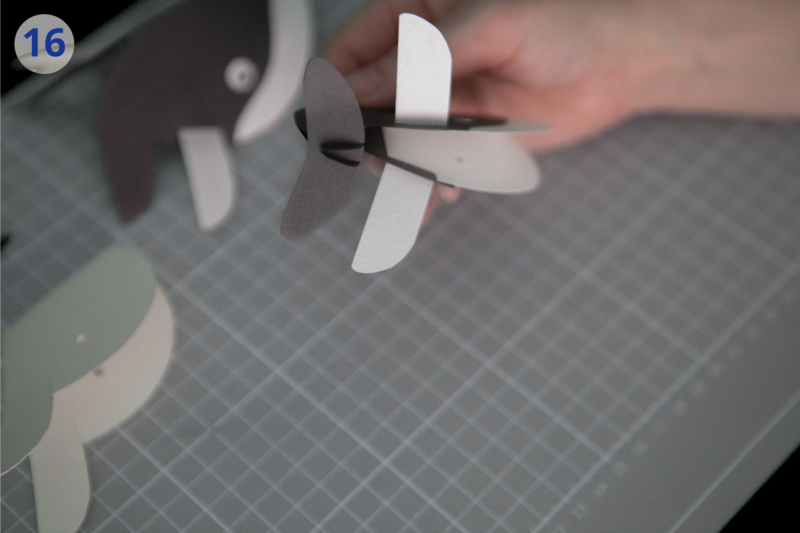 14 – Cut out the tail fin (3). 15 – Cut the two small cuts in the center of the tail in a very narrow v-shape. 16 – Attach the tail fin (3) to the body (2) by wedging the cuts on the tail fin to the cuts on the tail. 18 – Determine how much distance you want between the whales and the large metal ring, and tie the thread through. 19 – Gather the three threads from the metal ring so that the ring hangs parallel to the floor. Find the distance you want from the large ring to the ceiling, and tie the three threads to the small metal ring. 20 – Screw a hook to the ceiling, and mount the mobile. Make sure to hang it safely and so it can’t fall down on the baby, or that it can’t be reached by the little one. Then all that’s left is leaving the whales to float soothingly over the little peanut.